For a self-guided tour around the island, you can rent bicycles (60 baht per day) or motorbikes (300 baht per day) from Charlie’s Bungalows, though a few other guesthouses tout similar rental services. Browse places to stay in Ko Si Chang on Agoda.com. Free cancellation. From the Tourist Information Centre at the pier, you can rent motorbikes (80 baht per hour, 250 baht per day, 300 baht per night), or they will direct you back to Charlie’s Bungalows for bicycles. 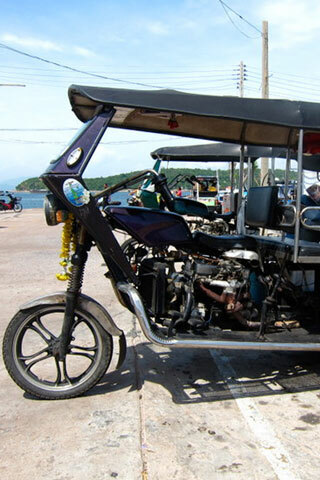 Renting a motorbike or bicycle is the best, and arguably the only real way, to â€˜do’ Ko Si Chang. Though the bicycles tend to be flat and the roads sometimes strenuous, the island is easy to navigate, especially with a map from the Tourist Information Centre handy. Ko Si Chang is also a pleasure to explore by foot, and you can always take a dip at Tham Phang Beach to cool off. You can also hire a samlor driver for the day. The vehicles are more spacious than the Bangkok flavour, and can fit four to five people if you squeeze (300 baht, but can be less depending on your bargaining skills). The drivers are often running multiple tours at once, so establish a firm time and place for pick-up and drop-off, and always get their cell-phone number. While there is a standard Ko Si Chang hot-spot tour they will offer to take you on, you can rearrange the itinerary according to your schedule. Getting to the eight islands that frame Ko Si Chang is not possible without private boat rental, and is most cost-effective if you gather everyone you know for the ride. Nongnoo speedboats (T: (081)3775708, (081) 5766447, info@nongnoo-speedboat.com, www.nongnoo-speedboat.com) advertise widely around the island, and Tiewpai Park International Guest House a few blocks south of the 7-eleven offer their own rental service for snorkelling and fishing excursions. For a less ambitious trip, you can rent a banana boat or a kayak at Haad Tham Phang (Tham Phang Beach).